Carpenter ants can be very destructive to a home or any other building, but how can you know if your house is infested, and what can you do to get rid of this damaging ant? 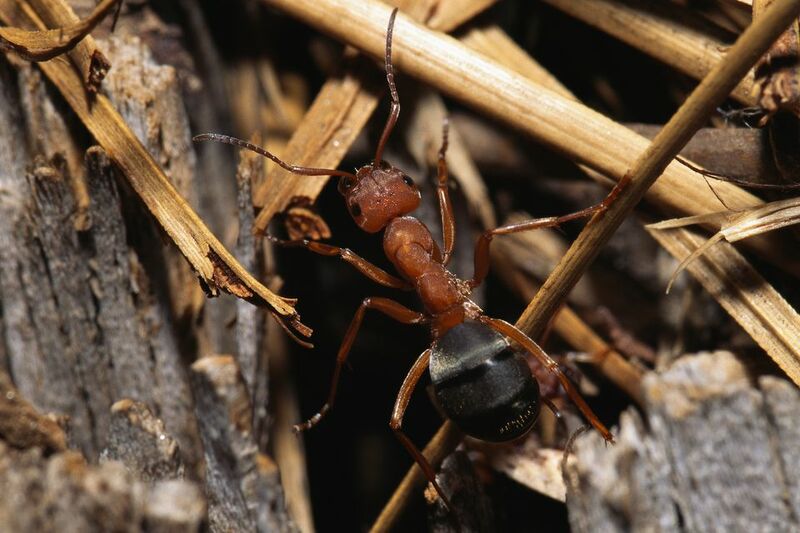 Start by taking a close look to positively identify the ants and checking for signs of infestation, then eradicate the ant colony and correct the problems that likely invited the ants in the first place. Use your finger or to flick one of the ants into a small plastic or glass container with a lid, and put on the lid. Place the entire container, with the ant, in the freezer for a few minutes. Remove the container from the freezer and the ant from the container. Place the ant on a plain surface so you are are looking at its profile. —a smooth rounded back with no humps. —a tiny pyramid, or pedicel, at its waist. If you see these, you will know you are looking at a carpenter ant. Note: carpenter ants can be of various sizes—from very large to very small—so the size of the ant does not matter. You will see the ants in the home over a period of several days or weeks. You may hear them scurrying about inside walls, especially at night. Locate the nests by following the well-defined trails of the foraging carpenter ants at dusk or after dark. The ants will be going in both directions, and those moving toward the nest may be carrying insects or bug parts for food. Carpenter ant nests may be outside the home in a tree stump or near an entrance/crack into a home. Treat outdoor nests by spraying a pyrethrin aerosol directly into the nest for at least 10 seconds. If a nest is within a wall void, drill a 1/8-inch hole and spray the same pyrethrin product through an injection straw. If you prefer a less-toxic treatment, you can "puff" diatomaceous earth or silica gel into outside nests; be sure to wear a dust mask to avoid inhaling the product. Repeat the treatment if the carpenter ants are still present in the home after two weeks. Seal all cracks and gaps on the home's exterior, including pipe and other wall penetrations. Dry up leaks outside and inside the home and repair or replace any moisture-damaged wood. Chip stumps in the yard, ensuring that the wood debris is mulched or located far away from the home. Locate firewood piles away from the home, so that they do not touch the home or garage wall. Trim tree branches so that they do not touch the exterior walls or roof. Maintain a clearance of 6 inches between wood siding and the soil to ensure that the siding does not wick moisture from the ground and provide ants another route into the home.